12 pp. Roman, 389 pp. Tima is one of three languages of the isolated Katla cluster, consisting of Tima and the neighboring closely related Katla and Julud. All three languages are spoken in the Nuba Mountains, Sudan. According to Greenberg (1963), the Katla group belongs to the subgroups forming the Kordofanian branch of Niger-Kordofanian (Niger-Congo). However, the genetic relationship of the Katla group as part of Kordofanian is not undisputed. The languages of this group may constitute a separate branch within Niger-Congo (cf. Dimmendaal 2009). The Tima community has roughly 7,000 members, about 1,000 of them having moved to Khartoum and elsewhere in Sudan due to various reasons. Those living outside the homeland were the first to observe that their children do not speak the language properly anymore. However, also those Tima who still live in the Nuba Mountains noticed that Arabic is taking over as means of communication not only between the Tima and their neighbors from various language groups, but also within the community itself. To counterbalance this development, the Tima have formed a language committee who sought the help of linguists with the aim to be able to write their language and to collect as many words as possible in a dictionary in order to motivate their children using their ancestors’ language. Whoever has been concerned with compiling a dictionary knows that it is impossible to ever really ‘complete’ the work on a dictionary, especially not within the short time span of a few years. 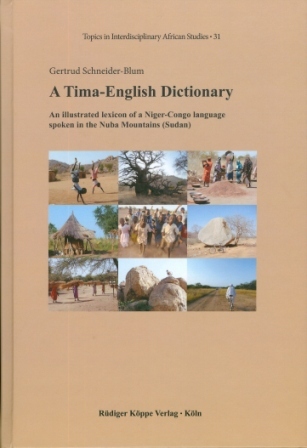 Consequently, this dictionary is not all that the Tima language has to offer, it rather presents the result of six years’ work. 2,400 roots are the base for more than 1,000 nouns and 400 compounds, 400 verbal concepts with different derived realizations, 200 adjectives, and 150 adverbs, to mention only the main important word classes. Numerous example sentences convey an impression of the words’ usage. The close affiliation to the territory the Tima inhabit gave reason to enter more than 400 proper names – mainly of places in the area – into the dictionary. Wherever it was possible, photos from these locations complement the entries. Cultural life in its various facets is equally illustrated as are the plants growing in the area to enable the outsider receiving an impression of the Tima peoples’ life in the Nuba Mountains.